When you’re out with a young teenage kid it’s hard to beat the beaches of the North East coast. DAVID SIMPSON explores some of the best beaches in our region. “Wow look at this view” you might hear me say as I drive through some lovely spot in the fabulous Northumberland and Durham countryside. My thirteen year old who says she loves it when I take her for drives in the countryside lifts her head, momentarily, from her phone, to see the lovely winding River Coquet up in the Northumberland dales, glistening in the summer sunshine. “That’s nice”, she says, before quickly returning to the engaging glow of that tiny screen. It’s hard to inspire young people about our region’s wonderful scenery but at least when I test her patience by leaping out of the car (parking up first) to take a quick snap of an interesting castle, village, dale or vale, she can still maintain the undisturbed contact with her digital world. “Is it ok if I take a quick picture?” I ask, though the question is rhetorical, I’m going to take that picture. “So long as I don’t have to get out of the car”, she sighs. Now I’m not complaining. I remember a distinct lack of passion for endless nature, knowledge, views and visitor centres in the distant days of my own youth out on those long day trips with my mum and dad. My feelings of indifference weren’t that much different to what my daughter feels now and there were no digital distractions for us kids back then. The beach, I’ve found, is the best place to bond with the girl. It’s just unbeatable. It’s not just about bonding with your kids though. I’m single and in my occasional, mostly unsuccessful, ventures into online dating I’ve discovered just about every lovely lady out there in our region declares an interest in their online profile for “exploring the Northumberland Coast”. There you’ll find it in profile after profile, like there’s some kind of hidden sponsorship deal. 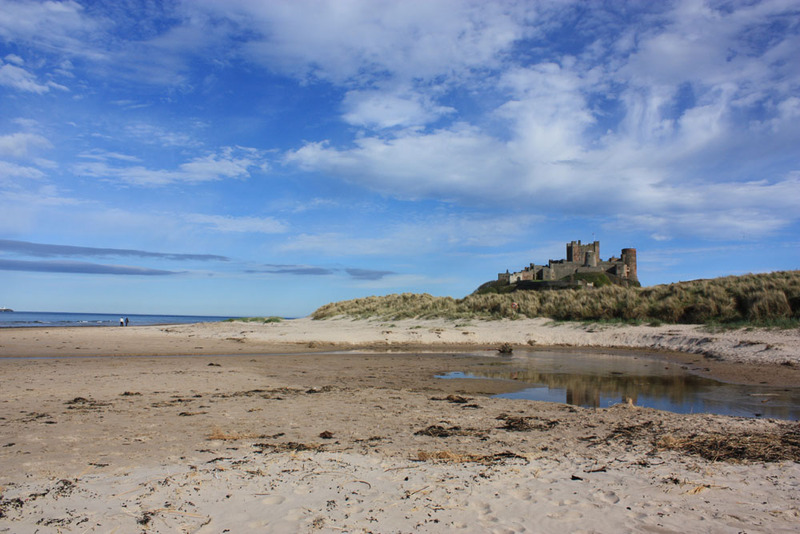 The coast is so predictably popular (though understandable given its ‘romantic’ beauty) that it makes me wonder how many couples wandering Amble, Alnmouth, Bamburgh, Beadnell, Whitburn, Whitley or wherever are only recently acquainted courtesy of findyournortheastcoastmate-dot-com if there’s such a thing. Anyway, I digress. When I’m out with the teenager the beach is a definite best choice and there are so many to choose from. I only see her properly at weekends every couple of weeks and during this glorious summer or even back in the winter, we have often ended up strolling along one of the region’s beautiful beaches. Our coast really is stunning and not just in Northumberland. 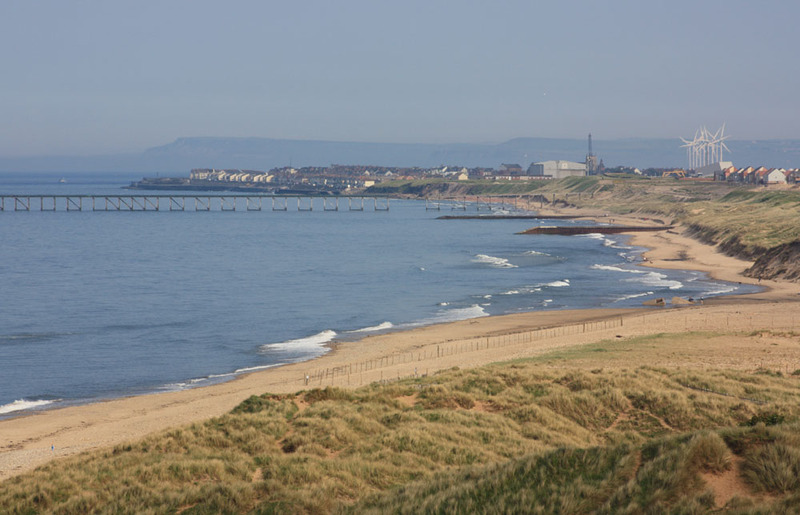 The beaches and coastline north and south of the Tyne as well as along the Durham coast or around the cliffs of Cleveland are all different and simply marvellous in so many ways. So far this year we’ve done Marsden, Whitley Bay, Whitburn, Seaburn, Saltburn, Tynemouth, Alnmouth, Bamburgh, Druridge Bay then Seaham, Seahouses, Seaton Carew and Crimdon and of course we’ve found the rocky shorelines around places like Craster or the Cleveland cliffs just as appealing. Some days were sunny, some days were winter grey and grim, but it never seems to spoil the fun. You don’t have to spend lots of money to enjoy our splendid coast. 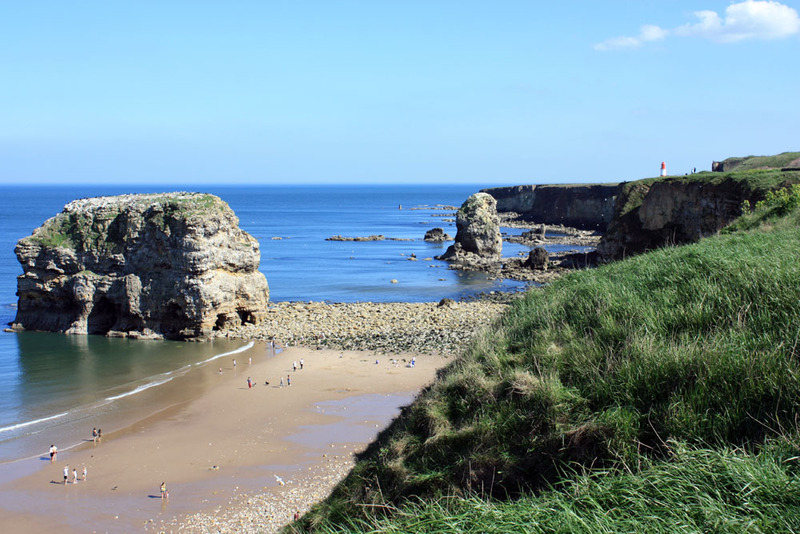 Just take a packed lunch, though I admit a lovely fish shop, café or perhaps enjoying a bite on the beach with table service from Riley’s Fish Shack at bustling Tynemouth or an enormous ‘posh’ fish finger sandwich at the Marsden Grotto pub can be part of the delight. Simply pottering about just seems to pass the time when I’m with the girl. This delighted beach dad can enjoy the views and take the occasional snap shot of spectacular scenes, passing ships or shapely sea shells but is just as happy gathering together a collection of countless coloured stones to make a mosaic on the beach or searching for crabs and limpets in a rock pool. The girl loves this kind of thing too or perhaps just writing her name or mine or her mum’s in huge letters in the sand. It’s good simple fun and so too is ‘plodging in a pool’, to use a North East phrase. My daughter found a nice pool formed by one of those huge concrete cubes, designed to keep the Germans out, though in fairness I saw no beach towels here. This was on the beach at Alnmouth and she was strangely engrossed by that pool. A great place for her to test her briefly reclaimed phone’s waterproof photography credentials (it fortunately passed), before it was returned to me and forgotten again. 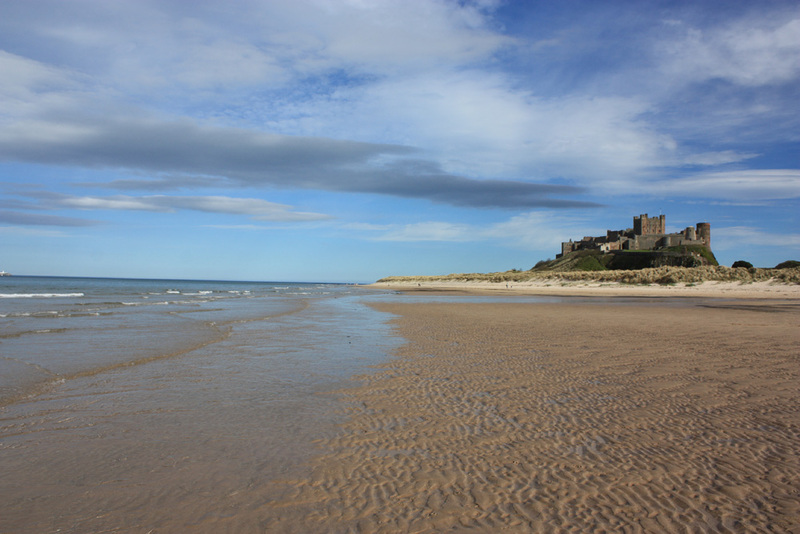 Whichever beach you choose, simply wandering along the shoreline with the mesmerising sound of crashing waves is just so peaceful and life affirming and if there also happens to be an extraordinarily majestic giant sand castle called Bamburgh looming in the distance, well that’s just a bonus. Now we’re not going to choose a favourite beach or coastal spot because, well, we couldn’t possibly be forced into any particular coastal corner. 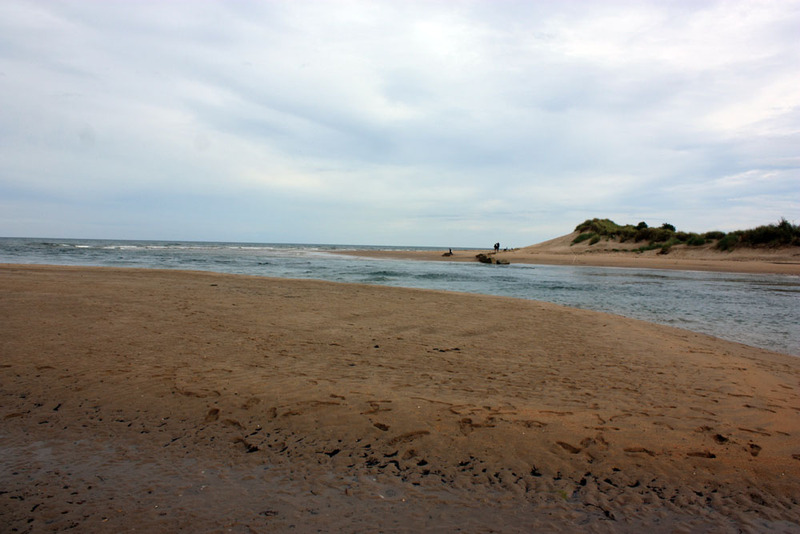 They’re all so different anyway with their own individual charms, so I’ll start by mentioning the last beach we visited at Alnmouth. We do love Alnmouth. So often people comment on how pretty it seems from the passing car as they head north along the coastal route but if you take a right turn and actually get out and explore this place it really is rather charming. Park up near the golf course to the north but watch out for golf balls. From here you can wander south along the beach, which then continues slightly inland along the little estuary of the River Aln itself and then onwards into the harbour with its moored up boats. 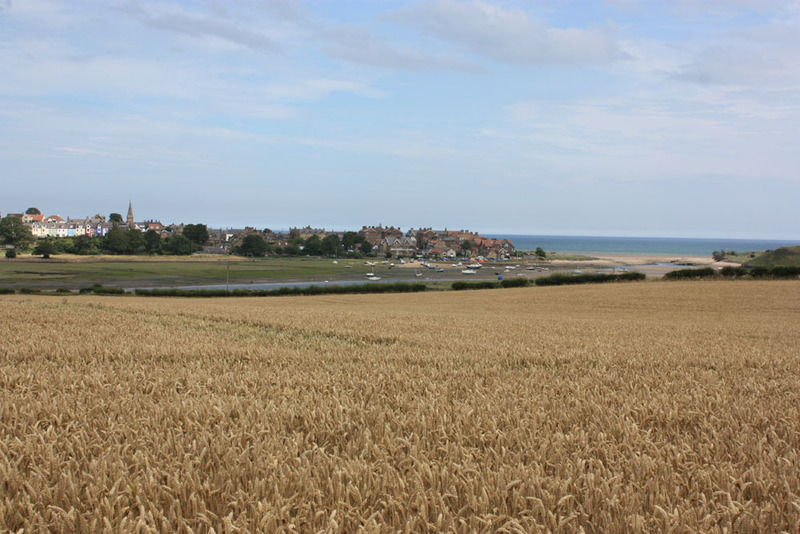 From there you can wander into the delightful little village of Alnmouth itself – or is it, perhaps, a very tiny town? Incidentally, my favourite fact about Alnmouth is that it was once fired upon by American privateer John Paul Jones during the American War of Independence when he came by in his passing warship. The cannonball missed the village church , bounced a couple of times and hit a farm building. Nobody was harmed. 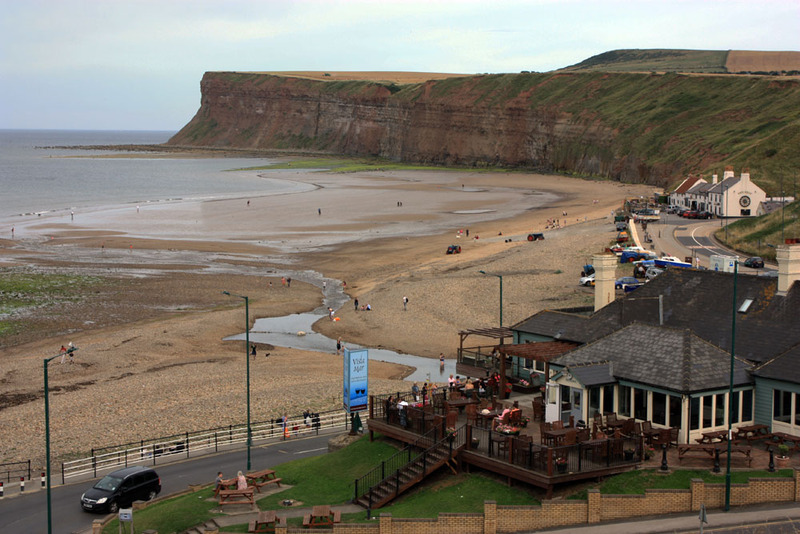 Down at Saltburn in the far south of the region (a part of Yorkshire we especially love) there’s a slightly stony stream that cuts across the beach to enter the sea where you can roll up your trousers, take off your socks and shoes and plodge across. Ah, the simple pleasures! 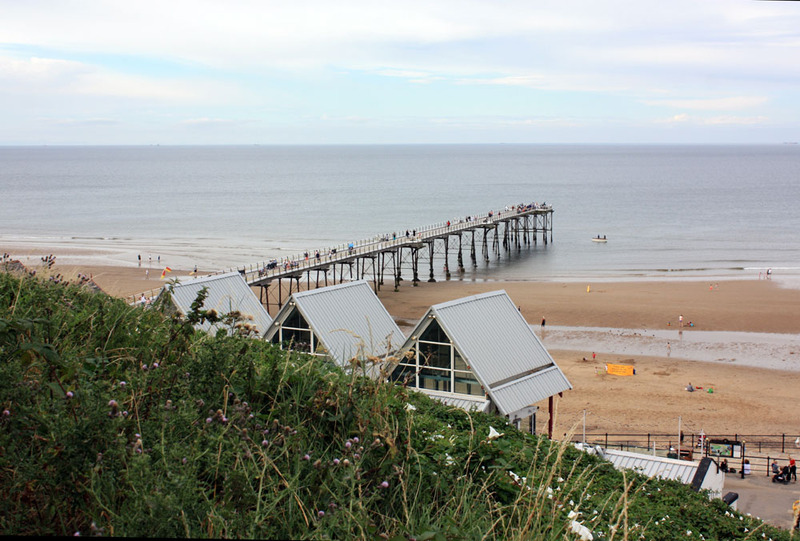 Here at Saltburn the daughter and I spent quite a lot of time at the end of the pier just watching kids effortlessly catching crabs in nets on long fishing lines dropped into and raised from the sea below. The daughter was delighted when she spotted a curious whiskered seal that popped its head out of the water to watch a couple of kids paddle by in a dinghy. 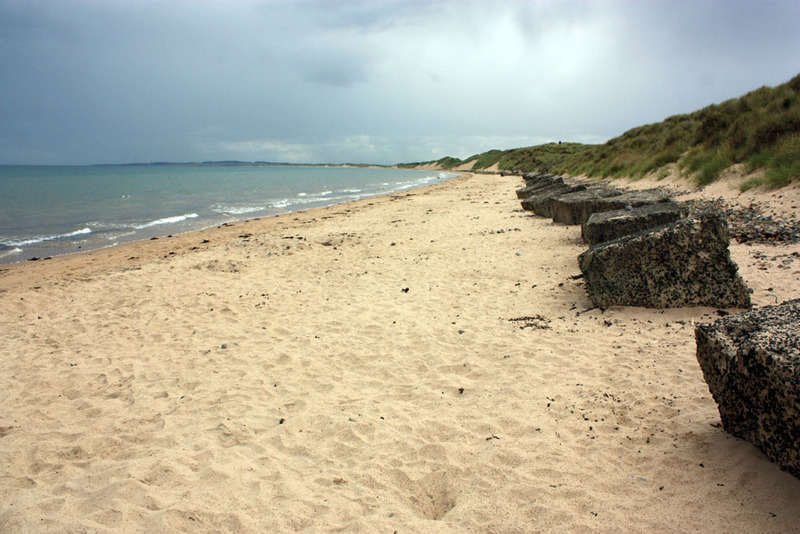 The sands of Northumberland’s Druridge Bay at five miles long are a delightful find that are perhaps not so well-known. They’re relatively sedate, quite different to the buoyant beaches of say Whitley Bay or South Shields to the south. Part of a country park, Druridge Bay has the added bonus of the lovely Ladyburn Lake, a substantial freshwater lake to the rear of the Druridge dunes. 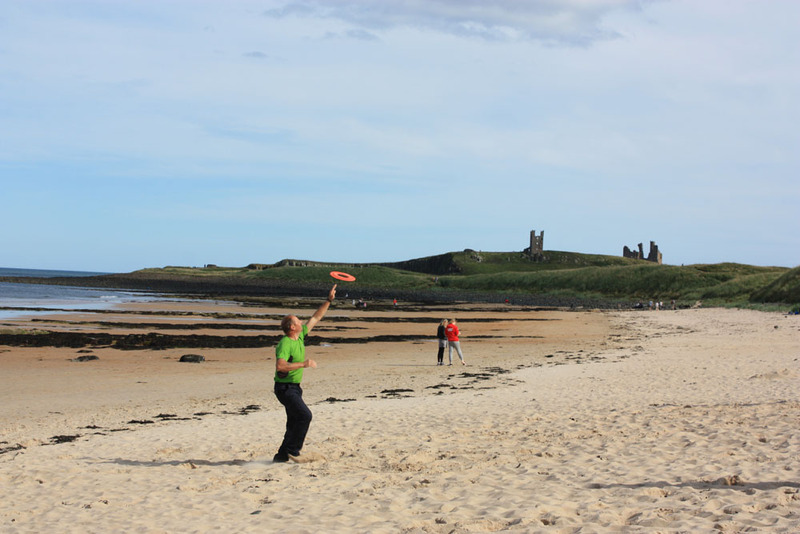 Tynemouth and Cullercoats are always firm favourites and justifiably popular. 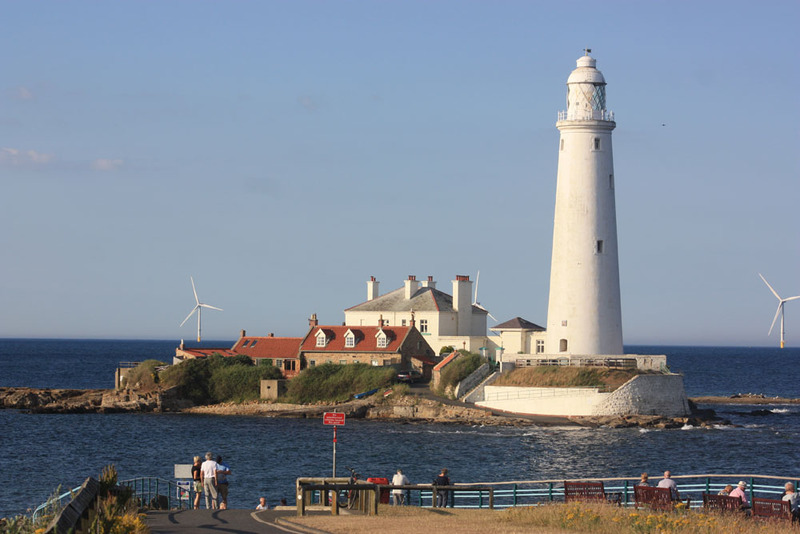 Whitley Bay looked lovely and lively in the sunshine on our recent visits even before they reopened the beautiful, elegant revamped Spanish City. We love the sandcastle sculptures there which are quite quirky and as for St Mary’s Island, I’m sure it’s been said so many times before but it’s simply picture postcard perfect. South of the Tyne, Marsden Bay is still a great spot and the novelty of the lift down the cliff to the grotto pub and beach below never loses its simple appeal. 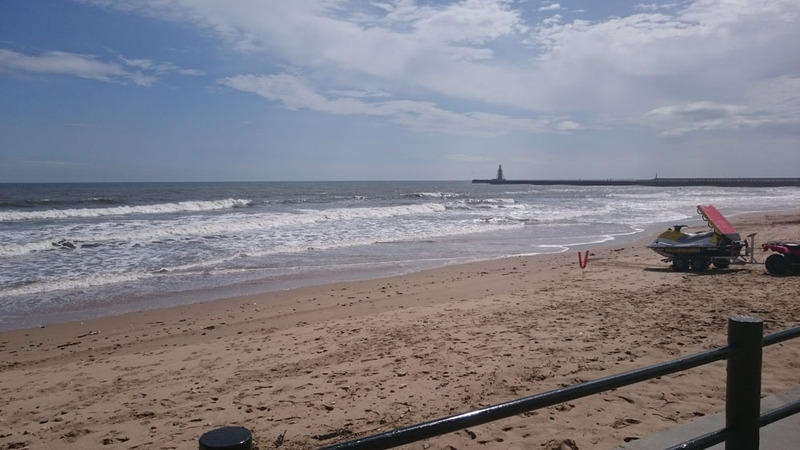 Further south, Sunderland is a city of super beaches which are always good for a wander. 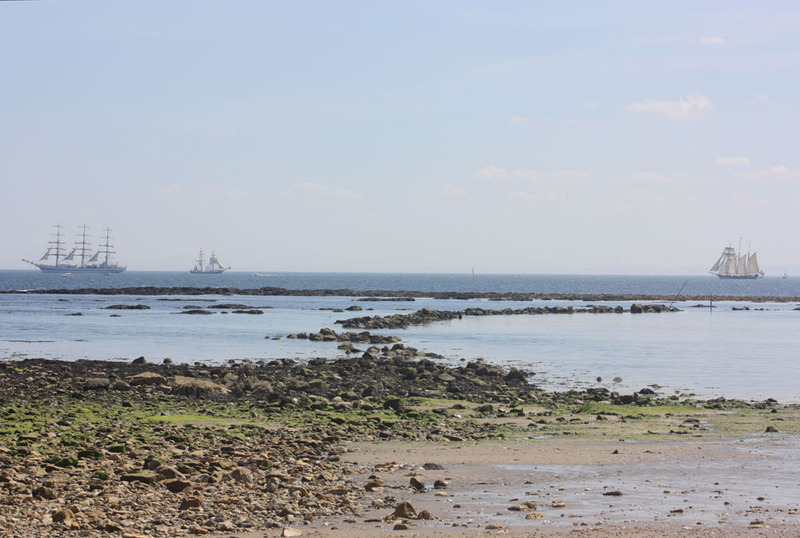 We recently walked down from wonderful Whitburn to Seaham and Roker during the Tall Ships Race as the ships headed out to sea and it was certainly a serene sight to see. 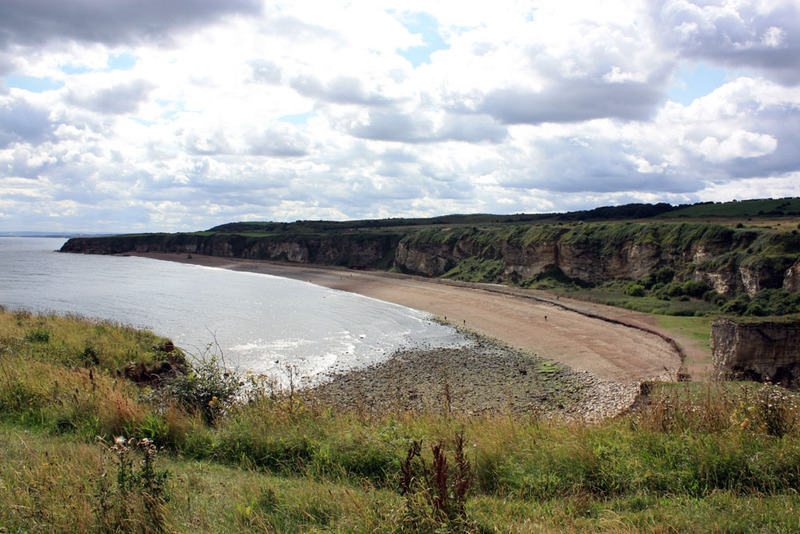 The Durham coast, once shunned by tourists for its industrial blight of now distant times has emerged as a new jewel following decades of intensive clean up and has several smashing beaches to explore. Many are still largely unknown even to residents of that county. 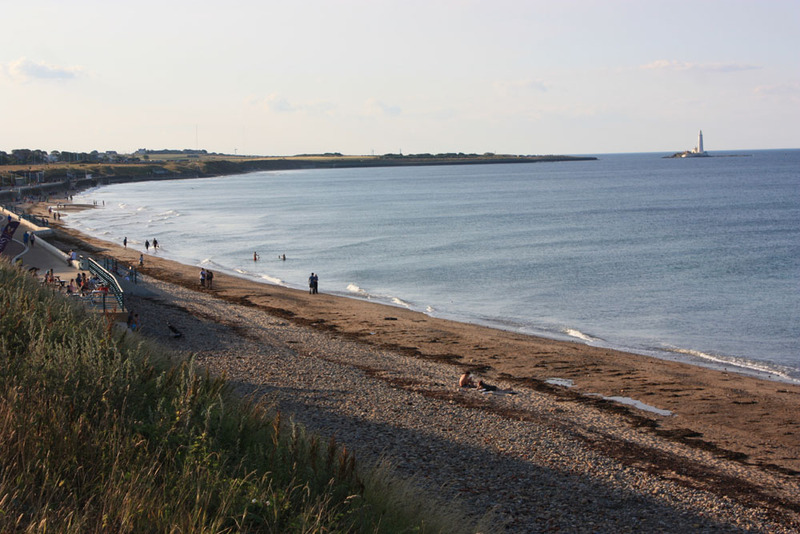 The unique terrain and natural environment formed by the meeting of the Magnesian limestone and the sea makes the Durham coast a special spot for nature especially when coupled with the beautiful neighbouring wooded denes that are a regular feature of this particular coast. 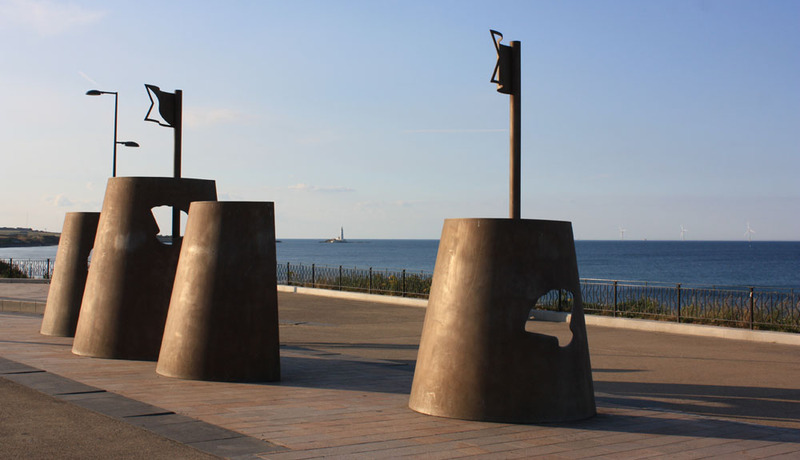 The town of Seaham Harbour has seen a stunning transformation and despite the rather industrial names of two of its beaches – ‘Blast Beach’ and ‘Chemical Beach’, – the names are in fact quite misleading as it is nature that now rules. 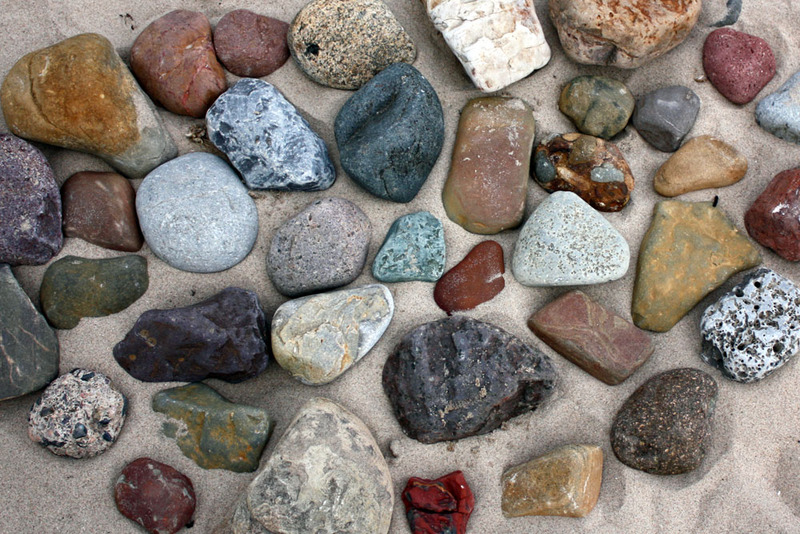 Speaking of jewels you may find pretty gems of many colours washed up on a beach here at Seaham. These wave-weathered, smooth, rounded pieces of glass were discarded into the sea by a Victorian glass works that once stood hereabouts and create a delightful little treasure to hunt for if you know where to look. Indeed the whole North East coast could be described as a wonderful gem in itself. I’m always flabbergasted to hear even the best-known beaches of our region described as ‘the best-kept secret’. For me and my girl it’s no secret at all, the North East coast is our familiar friend and a place where happy memories are made.